Our hostess, Veronika, showed us two pictures of Grieselstein she had hanging on their wall. We admired them, and asked if there was any way we could have copies made. Within the next five or ten minutes, she had taken the pictures out of their frames, and was on her way to have copies made for both of us! She didn't know exactly when they were taken, but the one on the following page seems to be a more recent one as there are more buildings. 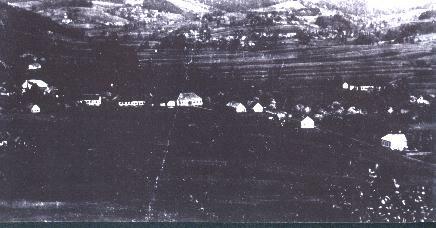 The Bruckler home is the dark-roofed one located just to the left of the double white buildings toward the middle of the picture. At the top of the picture it reads: "Ausflugsort Krieselstein im Burgenland"